Francis "Bug" Mosser knows the Sikeston Outlaw Gang's treasure is hidden near his home and he's determined to find it with the help of his brothers and his best friend. They go down into Devil's Hole looking for it, but their mom comes along and makes them go home before they can find anything. Unfortunately, there are others looking for the treasure too, which means they're in for a big adventure. 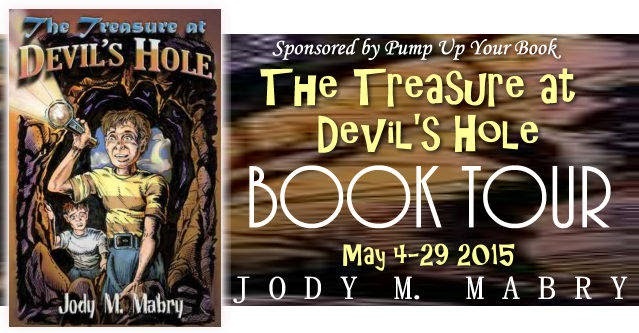 The Treasure at Devil's Hole by Jody M. Mabry is an exciting middle grade historical fiction novel that takes place in 1946. It's a book about a treasure hunt, a bully, bad guys and friendship. There's even a little love thrown in, although my son who read the book didn't seem to notice much! The characters are all a bit quirky, from Bug's brother Tom, who is always digging, to the bully Tad who appears to be up to something, and the teacher's new boyfriend who doesn't seem to fit in. My son Carter, who is 11, read this book and says it is more of an adventure story than a funny story, although there was one time when the dynamite blew a boulder through the ceiling of the house that he thought was pretty funny. He recommends The Treasure at Devil's Hole to readers who like adventure stories and treasure hunts. I'm guessing it would be a good summer read for reluctant readers as well. Connect with the author on his website, Facebook and Twitter. This review was written based on a copy of The Treasure at Devil's Hole that was provided by Pump Up Your Book in exchange for an honest review. This post includes Amazon Affiliate links. If you click on a link and make a purchase, we will receive a very small commission but your price remains the same.